The olive muddler minnow fly fishing streamer pattern is a very popular surface pattern and is often used as a top dropper. When fished on the retrieve it produces a good wake on the river surface which on a summers day attracts the attention of trout hunting just under the waves. There are two things that work in the trout fly fisher’s favor when fishing streams and rivers in flood in the spring. The first is that because there is so much fast moving water around the fish are not spooked by wading fly fishers. The second is that the fish are on the feed again after winter. In the early part of the season you have to select a fly, like the Muddler Minnow, which will make a Rainbow or Brown Trout think it is worth spending the energy to attack it. It is still very cold. Try to work out where the trout are holding up. Trout turn to eating small minnows when the water is in flood as it is hard for them to detect insects to eat. If the water is discolored tie on a dark colored streamer to lure the trout to an attack. There are a number of other streamers you could try ranging from black zonkers, woolly buggers, matukas to black ghosts. Try sheltered area of the river first. Look for pockets of water that are not moving as fast as the main body of water. That is the best place to go hunting fish. Normally I try the traditional down and across presentation when fly fishing with Muddler Minnows. In flood conditions I like to try and imitate the minnow swimming upwards, pausing and going to the bottom again. I do this by using the tip of my fly rod and lifting the fly up about one meter (one yard) and then down on a streamer lure cast up stream. It looks like an easy meal to the hungry full size trout. When you get a strike you know about it and instantly get a set hook as the fish is biting on a rising hook on a tight line. 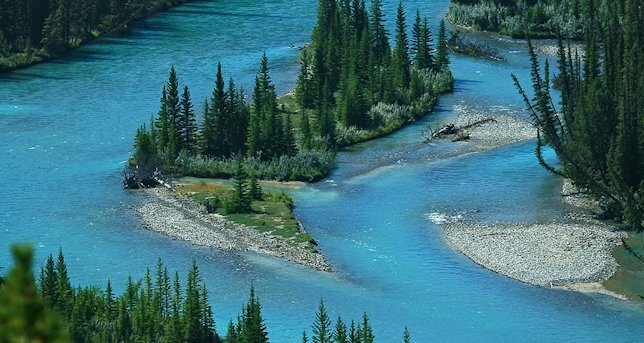 In larger rivers I wade downstream slowly and fish down and across. I use a slow six inch retrieves on a fly line with a moderately fast sinking tip with a rate of about three to four inches a second. Remember always take care fishing water in flood. Wear proper wading boots and a life vest. There are too many fatalities each year. Don’t become the next statistic. I was reading the tourist guide book section on fishing in Alberta. "With numerous insect hedges, the rainbow trout in the order of 2,500 fish per river mile. It makes for the finest fly-fishing anywhere. The trout grow to bragging size, with the average caught being 16 inches long, and many exceeding 26 inches. Fish of 20 plus inches are almost a daily occurrence and their fighting ability is remarkable." Sounds great but how much of that was tourist hype? We would soon see as I had already booked my Air Canada tickets. My first evenings fishing was on Alberta’s Bow River. I examined the water surface and spotted a few spent spinners coming down and what looked like a small dark winged caddis. I tied on an Al Troth dark wing olive elk hair caddis and cast it upstream and let it drift along the river bank. On my first cast, suddenly there was action. One after another small rainbow trout flashed at my elk hair caddis but didn’t hold. They were like quick-silver. My controlled pause, count-to-one, gently-tighten routine that is so productive on the English chalkstream was just not working. I then noticed a bigger trout showing its tail; a classic nymphing brownie. I knew what to do with that fish. I tied on a natural gray gold ribbed hares ear nymph and cast it spot on, to drift past its nose, only to be ignored. I was baffeled. Back at the lodge I sought advice from locals. They showed me their best producing fly. It was called the Bow River Bugger. It was an olive woolly bugger with a muddler head. They did not have any spare and there was nowhere to buy them or tie my own. My Olive Marabou Muddler Minnow was near enough the same pattern. I had a dozen of those in my bag. I felt much happier about the next days fishing. The lodge guide loaded up our drift boat with lunch and soft drinks. He launched it into the hurtling stream at Policeman’s flats. I had the choice of a casting seat or a section carved from the bow, against which I could brace both my legs. We drifted downstream and I cast the Olive Marabou Muddle Minnow into runs under the bank on a 3 foot leader. At first there was no interest. Then we moved into a section where there was faster water, not quite white water, but certainly the touch of a roller coaster here and there. Suddenly a rainbow trout smashed into my muddler. Within seconds it tore off the line down to the backing. At that moment the wind, the curse of Alberta fly fishing, sprang up to almost gale force. My rod arm was dragged down by the trout to almost parallel with the water. I could not bully this fish. My guide grounded the boat, leaped out and waded downstream armed with a long net. My wrist ached. I scrambled awkwardly from the boat and got ashore. I stumbled downstream amongst the boulders, trying to retrieve some line, which I was scared would not take much more of this punishment. Between the two of us we finally netted a 21 inch rainbow trout weighing 4 lb 2oz. Wow what a fun fight. After releasing that beauty we continued our drift downstream. I hooked into six more rainbows all under 1 lb using the olive marabou muddler. As we neared the landing there was a large pool of calmer water. I cast my muddler from the head to the tail water. Just as I was about to lift the fly out of the water near the tail I caught sight of a huge bow wave speeding towards my fly. Bang, a monster 27 inch rainbow engulfed my muddler. After a five minute fight we managed to net this magnificent fish. It was a days fishing I will never forget and worth every penny spent if flight tickets, travel and accommodation costs. The Alberta Tourist board promotional literature did not lie about the size of the fish and their fighting ability. Top dropper or Bob flies like the olive muddler minnow are often used on big reservoirs and lakes during the summer. The Bob fly is one of the most productive positions on any still water cast when there are warm winds blowing across water surface and it is a cloudy day. I get excited on days like this, as I know the trout will be up high in the water column, looking around just under the waves for food. You need a longer fly fishing rod than normal, something between 10 and 12 foot, to be able to control the Bob fly as far away from your boat as possible. I normally use a floating line but if the water is choppy because of strong winds, I have used a sinking line. The leader length is no longer than 3 foot. I just use a Bob fly and very short repeated casts. When using the sinking line make sure that the Rod is held high. This is to stop it getting blown all over the place in the high winds, as so often happens when using the lighter floating line. This gives you greater control of the Bob fly. You can even hold the fly's position still in one place, if you need to. Next time you are out on the water with a friend when there is a reasonable stiff breeze making the water choppy, try an experiment. Both of you use sinking lines. One of you let your Bob fly just move with the water current. The other should try to keep the fly in a static position. See what reaction you get from the trout. The first time I tried this, I was shocked by the results. There were more fish interested in the static fly than the one that was moving naturally on the water surface. So why is using a Bob fly a successful tactic in these weather conditions? First of all, the fish are near the top of the water so can see what is going on easily. They quickly spot the wake that the Bob fly creates on the water surface. It's like a great neon sign blazing at them in big letters, "Hello there is something interesting up here to eat". Once their attention has been drawn to the flies location and can see the silhouette of the fly pattern, they then make the decision whether to take the fly or not. I've often seen trout come to examine a Bob fly but at the last moment been has then been tempted to take the more imitative fly pattern fished on my middle dropper. The Bob fly is an attractor fly. It gets the trout's attention and either entices them to take the fly or brings them near enough to see the other flies you have on offer. Make sure your fly box is ready for all weather conditions. The rougher the weather gets then bigger the hook size you will need. On stormy days I go for a hook size 8. Flies that contain deer hair are particularly good as a surface fly because the deer hair adds buoyancy. Choose a Muddler Minnow, a grass Hopper, Goddards Caddis (G&H sedge), a big daddy longlegs fly, Humpy, Adams Irresistible or Wulff fly. In hot summer weather rainbow trout often like a fast stripped fly. Wild brown trout prefer a slower retrieve. From the end of May through to September the Brownies seem to prefer imitative patterns. 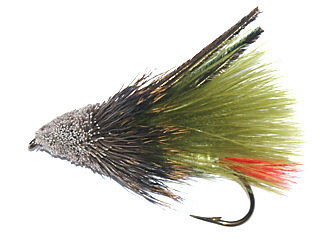 The muddler minnow fly is a very popular surface fly choice. It looks very similar to a caddis in smaller hook sizes. I found that takes of the muddler can vary. You will find that on some days you will get follow after follow, but no positive takes. I think the fish are trying to work out if it is good to eat. Don't give them time to have a close-up examination. Increase the speed of your strip and the trout will normally take the fly with a solid bang. They don't want it getting away just in case it is edible. Another good tactic when stripping a muddler minnow back towards the boat and you see you can see that trout is following, is to just pause and allow the muddler minnow to remain static for a few seconds. This is often when you get the take. Gregor Fulton wrote: "Fascinating! I also think the deer hair creates very attractive vibrations in the water. Fishing in Iceland years ago the conditions were all wrong. The locals battled on with their Francis flies to no avail. I put on a size 8 Muddler Minnow and stripped it back, on the surface or just sub-surface and took fish after fish! This is not boasting. It's just advice, as in the piece above, that you constantly have to think outside the box! BTW - and this IS a plug - very shortly one of the best boat rods I have used (10'6'' LW 6/7) will be available on www.mcgregorfly.com . It took two years to develop, but it's a honey! Tight lines to all! "